2015 is here and already more than half of January is over. Every year it feels the same - there is so much excitement about the new year, but soon it wanes. The calendar changes, but the days, the chores are the same and soon, we are back to the same old life. But, does that mean we should not be celebrating? Definitely not - life is all about celebrating the small things in life - however mundane they may seem. And new year comes only once a year. So, it is definitely worth celebrating. So, I decided that the first post on this space this year should be something that signifies celebration. 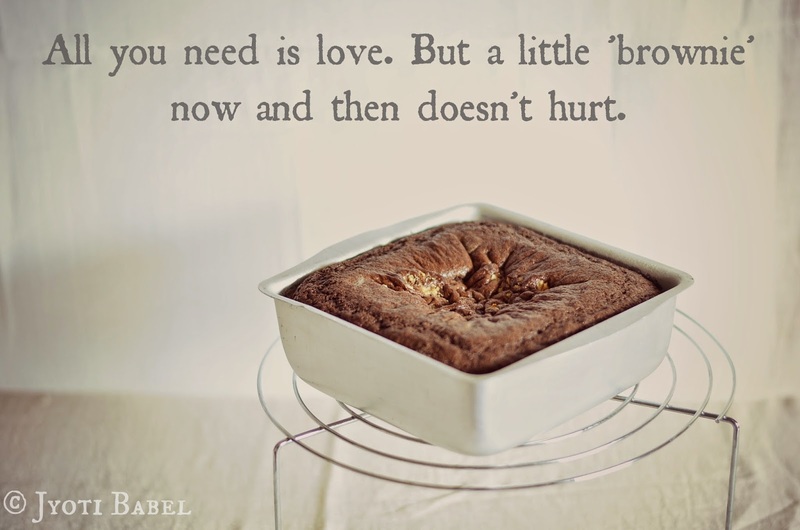 And to me brownies fit the bill perfectly well. I am a self professed brownie lover. 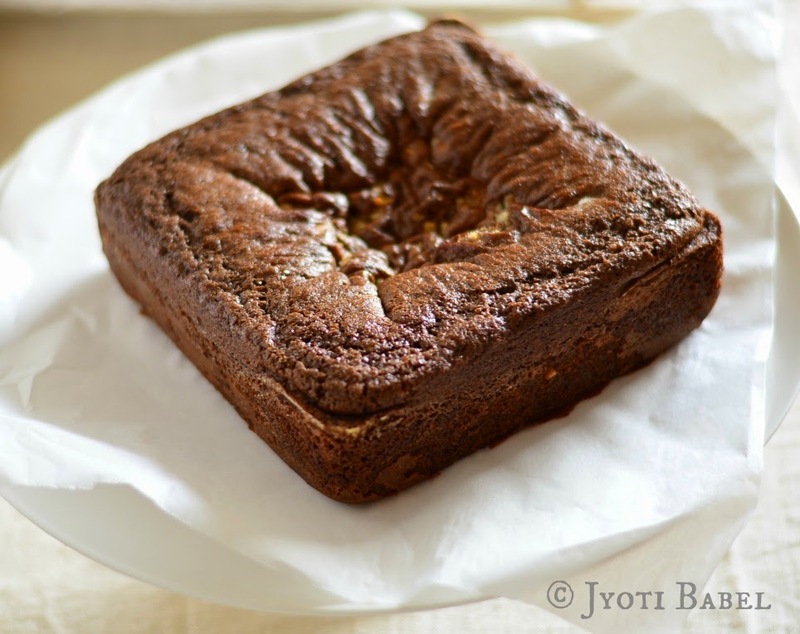 I have already shared some brownie recipes here, so do check them out too. 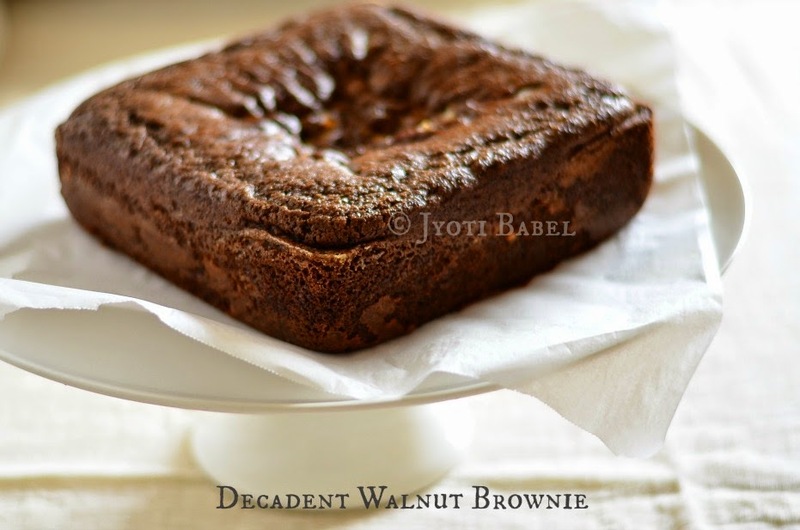 The brownie recipe I am sharing today is adapted from here. I have made some changes in the measures of the ingredients and the process of preparation so that it turns out less cake like and more fudge-y. So, let's hop on to the recipe now. 1. Grease a 7" square pan. Preheat oven at 180 C.
2. In a large bowl shift the flour, baking powder, baking soda and instant coffee. 3. Melt the chocolate in a microwave or by using double boiler method. To it add the butter, condensed milk, vanilla and milk. Stir nicely so that the mixture is uniform. 4. Now add the dry mixture into the wet mixture and whisk nicely to form a uniform batter. 5. Pour the batter into the greased tin. Sprinkle chopped walnuts over it. 6. Bake in the preheated oven for 30 to 35 minutes. To check if it is done, insert a toothpick in the middle. If it comes out clean then it is done. 7. Let the brownie rest in the pan for at least 10 minutes. 8. Once it has cooled down, slice and eat. Enjoy! 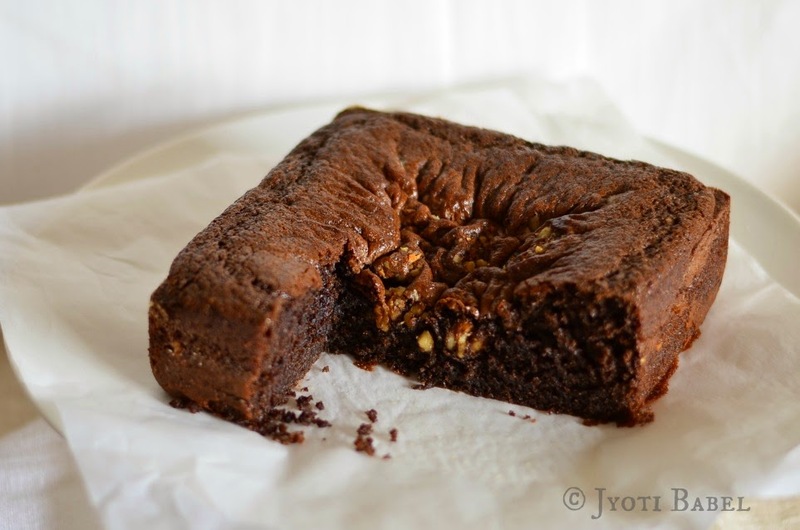 Note: I baked it a 6" square pan and that is why the middle of the brownie is a bit wrinkled. Using a 7" square pan will be a better idea.